A few weeks ago the young lizards saw daylight. Young common lizards develop in the eggs in the female lizard’s body, are hatched at the egg-laying moment and usually the lizard mother bears 7-8 young ones. They start life on their own at once. Body length is a little less than four centimetres and the tail is already longer than the body. Colour dark brown but it is variable. The older they are, the lighter the colour. The common lizard is our most common reptile, preferring rather damp habitats; in stone walls or plank stacks near country houses they feel nicely at home. This year’s young bask with pleasure in the late summer sun on some stone. In case of danger on dry land they look for shelter under stones or tree stumps or hide in moss or grass. Near a water body or a puddle they rush into the water, running a bit along the bottom, then burrow into mud or leaves at the bottom. 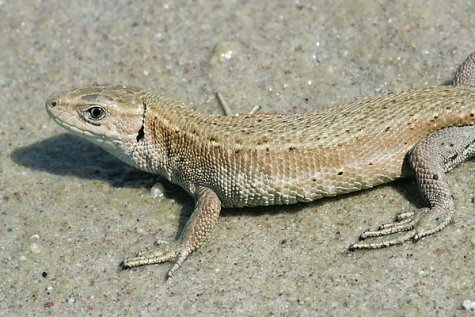 They cannot be confused with sand lizards (Lacerta agilis): these are rarer and their habitats are dry and sandy areas, away from settlements. The slow-worm (Anguis fragilis) is a limbless lizard; and so all our lizards have been mentioned.